All kinds of pressure cookers. Large size pressure cookers up to 23 litres. 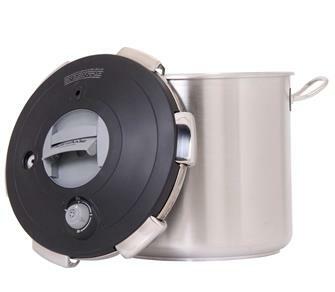 Stainless steel pressure cooker with bayonet closing system - 2.7 l., 1.10 bars. Stainless steel pressure cooker with bayonet closing system. 4 l., 1.10 bars. Stainless steel pressure cooker with bayonet closing system. 6 l., 1.10 bars. Stainless steel pressure cooker with bayonet closing system. 8 l., 1.10 bars. 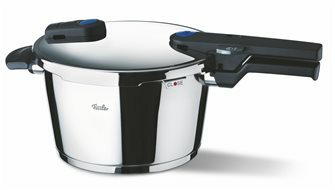 Pressure cooker 4 litres with clip-on closing system. Stainless steel pan and lid, triple layer heat distribution base. Cooking pressure: 0.70 / 0.85 / 1 bar. Suitable for all hobs including induction. Comes with a glass lid. Pressure cooker 6 litres with clip-on closing system. Stainless steel pan and lid, triple layer heat distribution base. Cooking pressure: 0.70 / 0.85 / 1 bar. Suitable for all hobs including induction. Comes with a glass lid. 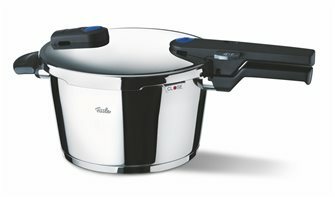 Pressure cooker 10 litres with clip-on closing system. Stainless steel pan and lid, triple layer heat distribution base. Cooking pressure: 0.70 / 0.85 / 1 bar. Suitable for all hobs including induction. Comes with a glass lid. Pressure cooker 15 litres with clip-on closing system. Stainless steel pan and lid, triple layer heat distribution base. Cooking pressure: 0.70 / 0.85 / 1 bar. Suitable for all hobs including induction. Comes with a glass lid. 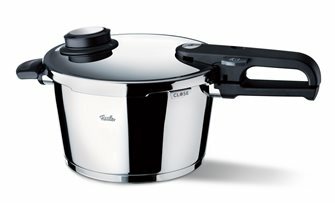 Pressure cooker 23 litres with clip-on closing system. Stainless steel pan and lid, triple layer heat distribution base. Cooking pressure: 0.70 / 0.85 / 1 bar. Suitable for all hobs including induction. Comes with a glass lid. 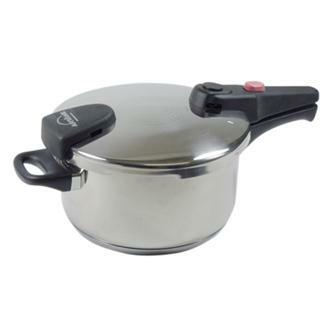 Stainless steel 4.5 litre screw pressure cooker. 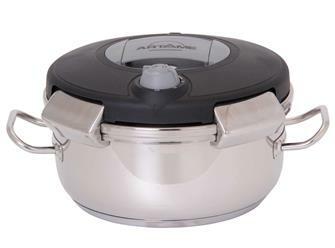 Convex pot for optimal heat distribution and steam convection. Suitable for all hobs including induction. 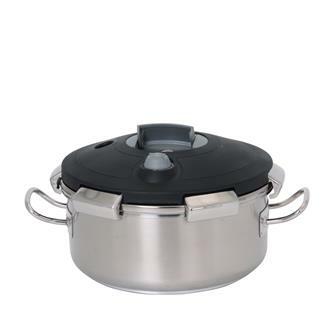 Stainless steel 6.5 litre screw pressure cooker. Convex pot for optimal heat distribution and steam convection. Suitable for all hobs including induction. 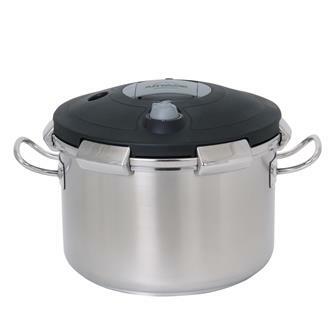 Stainless steel 8.5 litre screw pressure cooker. 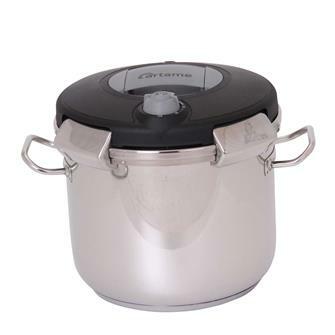 Convex pot for optimal heat distribution and steam convection. Suitable for all hobs including induction. 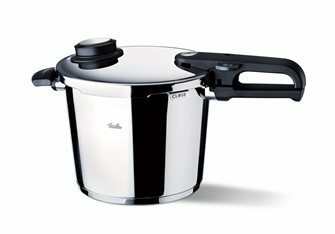 Pressure cooker - 8 litres - with a clip on lid. Stainless steel saucepan and lid, triple layer heat distribution base compatible with induction hobs. 3 cooking pressures. Comes with a glass lid. 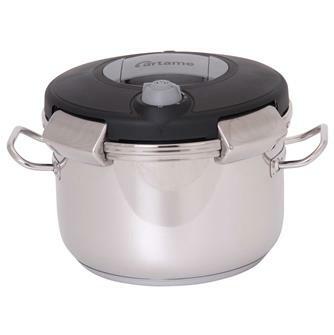 Premium Pressure cooker 4.5 litre, 22 cm, with tripod and perforated inset. Premium Pressure cooker 6 litre, 22 cm, with tripod and perforated inset. 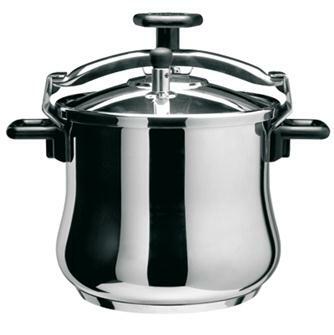 Premium Pressure cooker 8 litre, 26 cm, with tripod and perforated inset. Premium Pressure cooker 10 litre, 26 cm, with tripod and perforated inset. 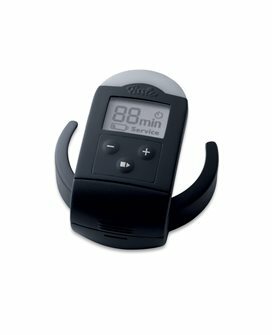 Electronic cooking monitor for Premium pressure cooker. 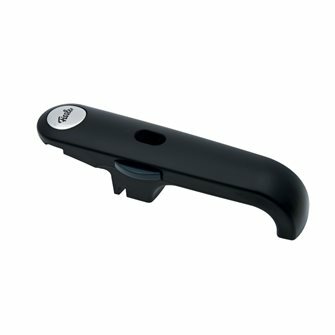 Lid handle Premium pressure cooker.